Tomorrow is IHOP Free Pancake Day. 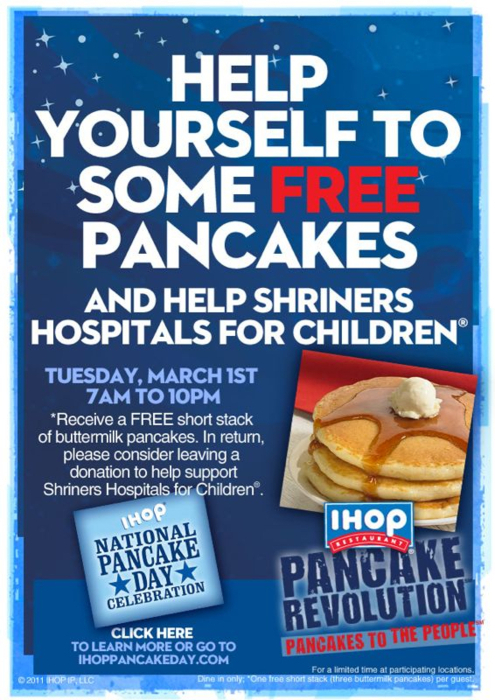 Expect a rush of people at IHOP tomorrow getting their fix of pancakes for free from 7am to 10pm. IHOP has a goal of raising 2.3 million dollars for Children’s Miracle Hospitals and other local charities. IHOP has given away more than 10.1 million buttermilk pancakes since 2006. Don’t miss out on this national event. Visit http://ihoppancakeday.com/ for more.